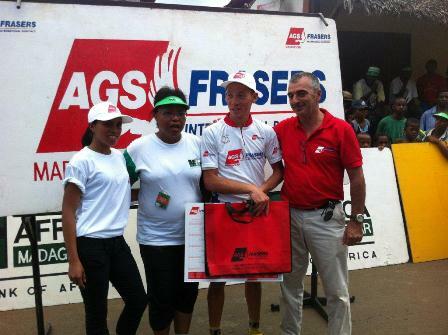 For the 2nd consecutive time, AGS Movers Madagascar was one of the three major sponsors (together with BOA and TELMA) of the 9th International Cycling Tour of Madagascar (TCIM) which took place 6-16 December, 2012. AGS International Movers not only provided two trucks for the transport of all tour equipment during these ten days, but was also proud sponsor of the maillot des points chauds, which rewards the most successful intermediate sprinters. “We chose this particular jersey because it values a consistency of high performance which fits perfectly with our company values,” said Branch Manager Frédéric Léomant who was proud to hand over the jersey personally at the end of each tour day. The sponsor of the maillot des points chauds is at the same time the benefactor of a team of six young Malagasy AGS Movers Madagascarriders wearing AGS Movers colours for the duration of the whole tour. The AGS Movers team also personally assisted by providing and driving a car which followed this team in order to help with technical problems and nutritional support. “To sponsor a team of young cyclists from this beautiful country is something close to our hearts,” said Frédéric. An international journalist was also in the car, keeping track of the action and sharing the same passion for cycling as the whole AGS Movers team. 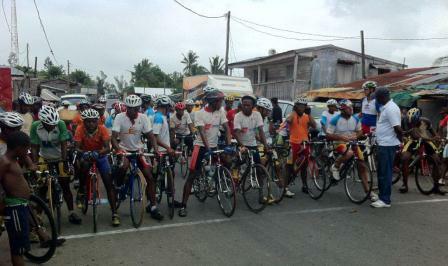 The International Cycling Tour of Madagascar is very popular in this country, not only because of the route itself but also because of extensive media coverage both in the newspapers and on television. AGS Movers Madagascar was pleased to not only play a vital role in one of the major sporting events of the year, but also support young Malagasy athletes as they took part in this demanding event.